Finally local and fresh, or a lot more local and a lot fresher than it’s been. Here’s an incredible salad the Accidental Locavore made, mostly sourced from the Union Square Greenmarket. Not sure how many points I’d get from the French for authenticity, but it’s the joie de vivre that they’d appreciate. 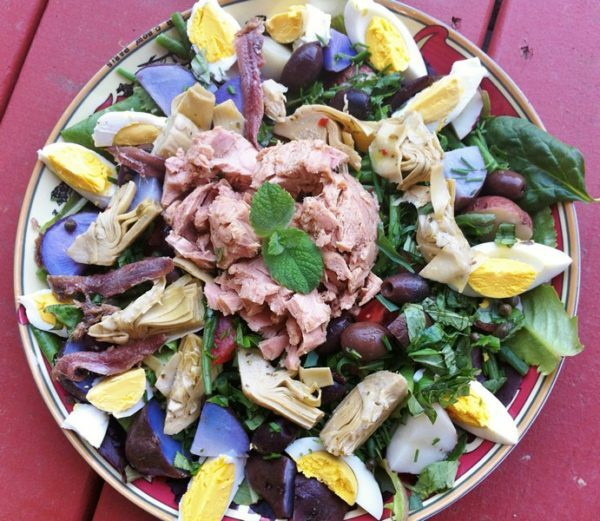 Salad Nicoise is all about riffing on the basic, with whatever looks good at the market. I had a couple of nice tuna steaks, so I was off to a good if non-traditional start. Boiling the eggs, the potatoes, steaming and shocking* your green beans ahead of time is a good idea. That way everything has a chance to cool down. In the summer, if it’s really hot out I do all the boiling stuff early in the morning, let it cool and refrigerate. Then all you’re left with is a construction challenge. I use these really big square black plates, cover them with a bed of mesclun from Migliorelli Farm up in Dutchess County. Then the hard boiled eggs (local from Quattro’s), quartered the long way. A handful of potatoes. This time I used some lovely fingerlings, and brilliant baby purple potatoes(check them out in the photo), from the Greenmarket. When tomatoes are in season, I mix up small ones of different color, but this time I just halved some grape tomatoes, mostly so they don’t squirt when you try to eat them. Another handful of capers, some Nicoise olives, artichoke hearts, beautiful French radishes, and of course, haricots verts (the skinny cousin of a green bean). Fresh herbs like basil, tarragon are great if you have them, and some scallions or chopped red onion are good too. For my husband, sliced beets, and a few anchovies. Since I was working with fresh tuna, I simply seared it quickly, and sliced it over the salad. If I use canned tuna, I use either the Spanish or Italian tuna in olive oil. Do not try this with canned tuna in water. You will hate yourself for it. For the dressing I put the juice of half a lemon in a jar with some red wine vinegar, olive oil (good quality), a small garlic clove minced fine, or put through a press, salt, pepper, and a big spoonful of Dijon mustard. If you should have any dried Herbs de Provence, crush a large pinch of them and add to the jar. Put the top on the jar and shake until all is combined and it begins to thicken slightly. Pour over the salad and enjoy! A bottle of rose, and chunks of baguette and you’re set, bon appetit! 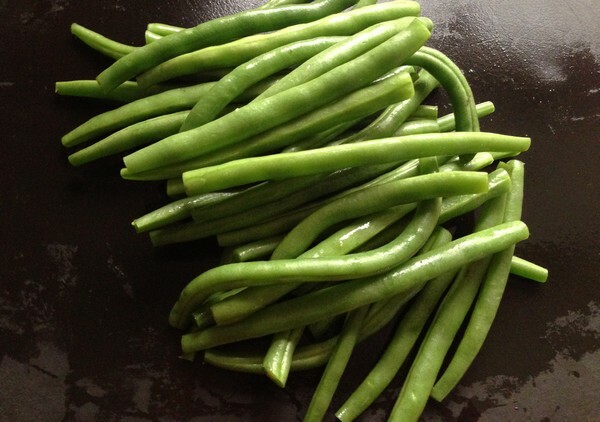 *To shock beans (or any other veggie) and stop them from cooking; prepare a bowl with ice and water. When they’re done cooking dump them in the ice water. I use a colander filled with ice and spray cold water over them from the faucet.